Your commute will take more time. Accept this and avoid being involved in an injury-causing crash! Perhaps you remember the term “defensive driving” from your drivers-ed days, but don’t recall what exactly you are and are not supposed to do to be safer on the roads. Many people assume that there is nothing they can do to avoid being injured in a car crash. In one sense, that is correct. In some car accidents, there isn’t much anyone can do to predict or change their behavior. Think, for example, of a rear-end crash when you are sitting at a traffic light. Your car isn’t moving, and the car behind you slams into you from behind. Nothing you can do to avoid that. Most injury-causing car crashes don’t follow that sequence of events. Defensive driving is a tactic, or approach to driving, that aims to avoid accidents, no matter what is happening around you. It has been described as driving as if everyone around you on the road is drunk. While that may sound pessimistic, there is merit in driving not only in an effort to mind your own vehicle, but in anticipation of what others may do on the roadway. For example, let’s suppose you are driving through a construction zone. You see signs of warning, and you see workmen on the roadway. A defensive driver is not only looking at the speedometer, making sure they’re adhering to the speed of the zone. Rather, the defensive driver is looking out for workers who may inadvertently step into the lane of traffic, or other things out of the ordinary that could result in injury. Tragically, men working near roadways are struck and killed in California every year. Many of these deaths could be avoided by using defensive driving techniques. When it rains in California, roadways become slick and unsafe. Slow down, schedule more time for travel, and practice defensive driving to avoid being injured in a crash. Defensive drivers routinely monitor what is going on around them, particularly what is happening in the immediate vicinity of their car. By definition, the Assured Clear Distance Ahead (ACDA) is the distance ahead of any terrestrial locomotive device such as a land vehicle, watercraft, skates, or skis, although commonly an automobile, which can be seen to be clear of hazards by the driver, within which they should be able to bring the device to a halt. This comes from the commercial driving manual, or the rule book that people who drive trucks, vans, and buses for a living go by. In short, the assured clear distance ahead is what drivers should be paying attention to. What could happen in the space in front of your vehicle? Many car crashes that result in injury happen in this zone. Are there cyclists around? Are there children at play? Is there a crowd, or people leaving a shopping store? Are there animals? Is there debris on the roadway? Is there a detour, or perhaps workers in the roadway directing traffic? By paying attention to the assured clear distance ahead, drivers must think about their immediate surroundings and consider what could happen. Flooded roadways can fill up suddenly and create dangerous driving conditions. Never attempt to pass through deep standing water. Most cars that are legal to drive in California can stop within a second or two. So long as your brakes are in working order, and you’re driving at a safe speed for the conditions, you should be able to stop before two seconds of recognizing the need to stop. It follows that when you’re driving, you should be aware of whether you would have two seconds to come to a complete stop within two seconds of needing to do so, or whether you are at least two seconds from the vehicle in front of you. And what if you are not able to stop that quickly? Recognizing that you’re trailing the vehicle in front of you too closely may be half the battle in avoiding causing a collision. Thus, if you’re thinking about whether you have two seconds to stop at any time, you’re going to have to make adjustments to your driving speed, and perhaps change lanes. In Southern California, stop-and-go traffic can be brutal, and when the freeways finally open up a bit, drivers tend to go as fast as possible. Zones where stopped traffic suddenly begins moving again can be very dangerous, and are the location of many traffic crashes. Tragically, injury and death are the result of bad traffic congestion. They don’t have to be, if drivers will pay attention to the changing conditions around them. Rain brings new driving conditions. Some changes, such as massive puddles and standing water, are obvious. Some hazards, like slick roadways, are less noticeable. California drivers, particularly those who are born and raised here in Southern California, are not known to be good drivers in the rain. We’re used to driving on dry roadways. Our habits, our reactions, our understanding of how long it will take to come to a stop - all of this is related to our weather patterns, which most of the time means warm and dry driving conditions. Rain changes everything. Not only is the roadway wet, but the water on the roadway mixes with oil on the road to create a slick surface. 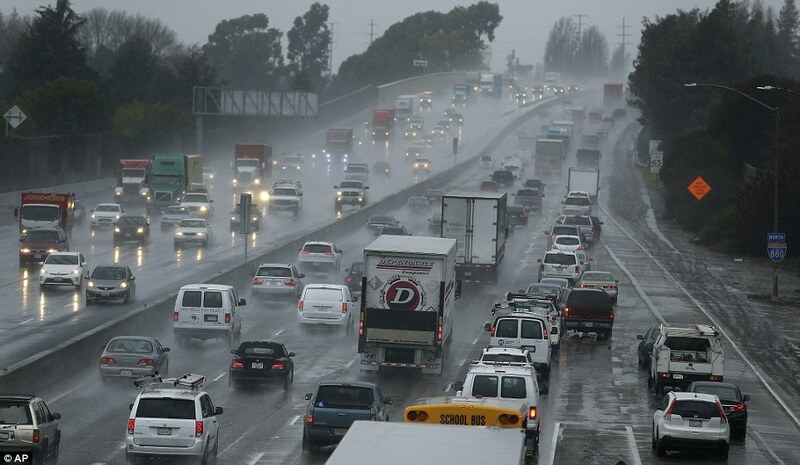 Every time it rains a significant amount in Southern California, there are literally thousands of car accidents. Many of these crashes cause injury, ranging from whiplash and so-called “soft tissue” injuries, to severe injury and even death. How to avoid causing or being involved in a car crash during a rainstorm? Follow the two-second rule, be a defensive driver, and slow down. Many people wisely avoid driving in the rain altogether. Sounds drastic? Remember, it isn’t just your driving you need to be worried about, it’s the other guy. Using public transit, such as the train or bus, can be a safe alternative. Train passenger volume rises when it is raining, so get to the train station early if you want to get a seat on the train. Speaking with an injury attorney may help you save a lot of money in the long run. Don’t assume the at-fault driver’s insurance will pay for your medical bills, no matter the facts of the incident. Despite your best efforts to be a safe driver, you may be involved in a crash that injures you. You may leave the scene of the crash feeling fine, only to wake up the next day feeling like you got hit by a train! A few pointers: make sure you get the other party’s insurance information. Take photographs. Don’t give recorded statements to the other party’s insurance. If possible, get a police report, or a traffic collision report. Get the names and telephone numbers of witnesses, if any. Perhaps most importantly, go to the doctor and get checked out. If your symptoms worsen, you may need more treatment than what you originally might assume. Think big picture: even though you may have had great experiences with your insurance in the past, or perhaps you were injured and were able to get your medical bills paid for in another crash. Every case is different, and you need to make sure everything you say happened is documented. The more objective the documentation, the better. Get checked out. And, if you have any questions about how the injury claim process works, speak with an injury lawyer. An experienced injury lawyer will be able to give you a general understanding of what you might expect moving forward. And, because every crash and injury is different, he or she can help you to make a plan so you can recover. Getting hurt in a car crash is no fun, but sometimes dealing with the insurance agencies afterwards can be the hardest part. A brief conversation with a law firm that focuses on injury cases is something that could save you a lot of time, energy, and money in the future. In all car accidents, you need to make sure you are taking care of your health, but you also need to make sure you aren’t assuming the best case scenario will play out. Even the most basic of crashes can turn into disputes, and you should never assume the other side will pay for your medical bills, no matter the circumstances. What you think is fair and reasonable may not be what insurance companies think is fair and reasonable. Document what happened, take photos, take names, and talk to an injury lawyer. Older PostHow Does a ‘Statute of Limitations’ Affect Your Injury Claim?